Which district court is the right district court? 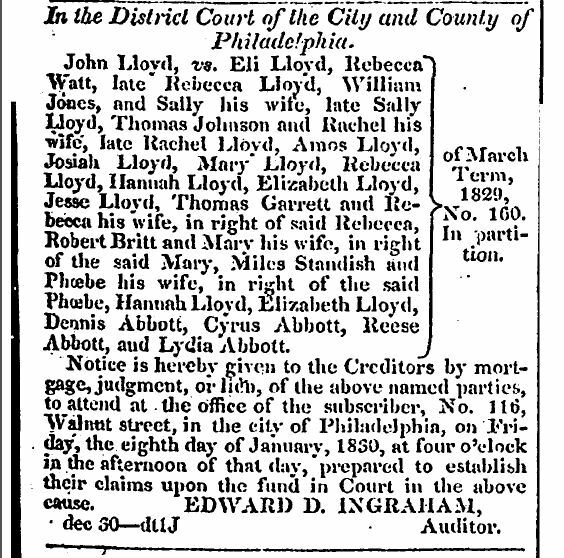 While we’re on the subject of Philadelphia and its records (yesterday’s mysterious Abraham Shechter settled in the City of Brotherly Love), reader Joan Peake ran into a snag recently with too many similarly-named courts in the Philadelphia of the late 1820s. A court case mentioned in the Philadelphia Inquirer in 1829 reported an action in a Philadelphia district court, and she wasn’t sure exactly which court that was. No wonder. There were three courts in Philadelphia at the time with “district” as part of their names. There was the Eastern District of the Supreme Court. There was the United States District Court for the Eastern District of Pennsylvania. And there was the Philadelphia District Court. Keeping them straight sometimes requires a scorecard. The news report in question1 was a legal notice to creditors in the case of John Lloyd v. Eli Lloyd and others,2 an action in partition,3 to show up at the auditor’s office on an afternoon in January 1830 prepared to prove whatever claims they had against a fund in court.4 The case, according to the notice, was No. 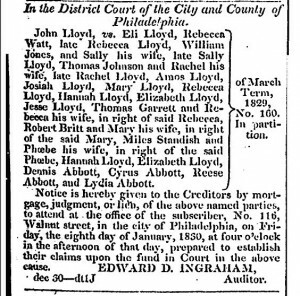 160, March Term 1829, in the District Court of the City and County of Philadelphia. The title of that Court was and is the Supreme Court of Pennsylvania, Eastern District, and that’s not the court of Lloyd v. Lloyd. The title of that Court was and is the United States District Court for the Eastern District of Pennsylvania, and that’s not the court of Lloyd v. Lloyd either. And the title of that Court was District Court of the City and County of Philadelphia, and that was the court of Lloyd v. Lloyd. The records for this Court are held today by the Philadelphia City Archives but here’s a warning. The search box at the upper left of the page can be wonky. Instead, use what experienced Pennsylvania genealogists14 use: the link in the box on the left to PHILS — the Philadelphia Information Locator System (direct link here). Where you want to end up is Record Group 22, Records of the Prothonotary15 of the District Court, here.